Demand-pull inflation is a period of inflation which arises from rapid growth in aggregate demand. 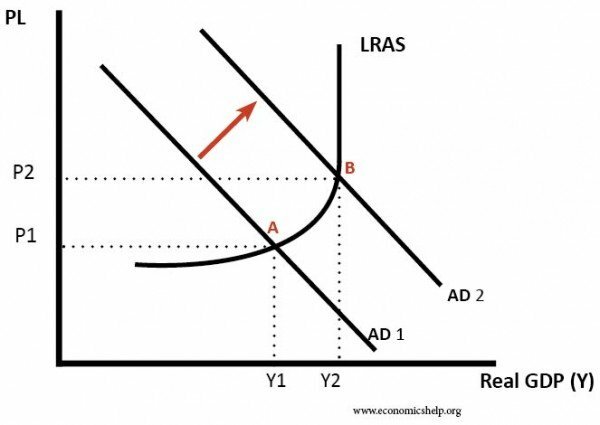 If aggregate demand (AD) rises faster than productive capacity (LRAS), then firms will respond by putting up prices, creating inflation. Inflation – a sustained increase in the price level. Demand-pull inflation – inflation caused by AD increasing faster than AS. The economy is at full employment/full capacity. The economy will be growing at a rate faster than the long-run trend rate. If aggregate demand is rising at 4%, but productive capacity is only rising at 2.5%; firms will see demand outstripping supply. Therefore, they respond by increasing prices. Also, as firms produce more, they employ more workers, creating a rise in employment and fall in unemployment. This increased demand for workers puts upward pressure on wages, leading to wage-push inflation. Higher wages increase disposable income of workers leading to a rise in consumer spending. 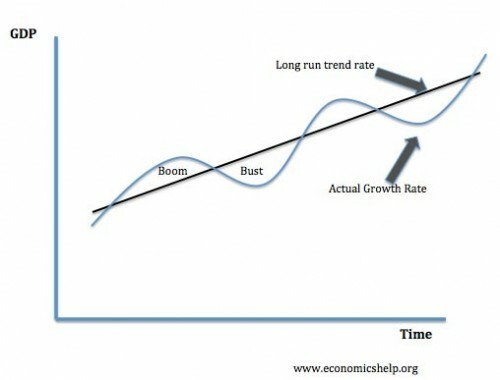 The long trend rate of economic is the sustainable rate of economic growth; it is the rate of economic without any demand-pull inflation. 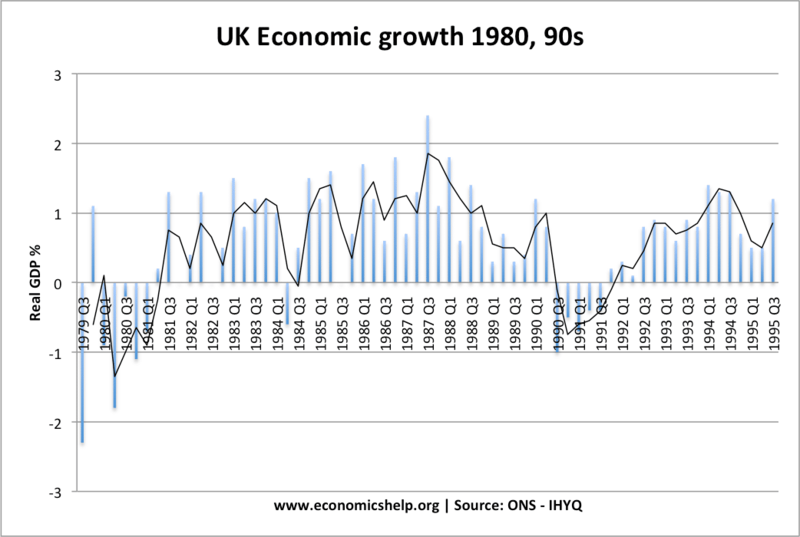 If economic growth exceeds this long-run trend rate, then it will cause inflationary pressures. In a boom, growth is above the long-run trend rate, and it is in this situation where we will get demand-pull inflation. Lower interest rates. A cut in interest rates causes a rise in consumer spending and higher investment. This boost to demand causes a rise in AD and inflationary pressures. The rise in house prices. Rising house prices create a positive wealth effect and boost consumer spending. This leads to a rise in economic growth. Rising real wages. For example, unions bargaining for higher wage rates. 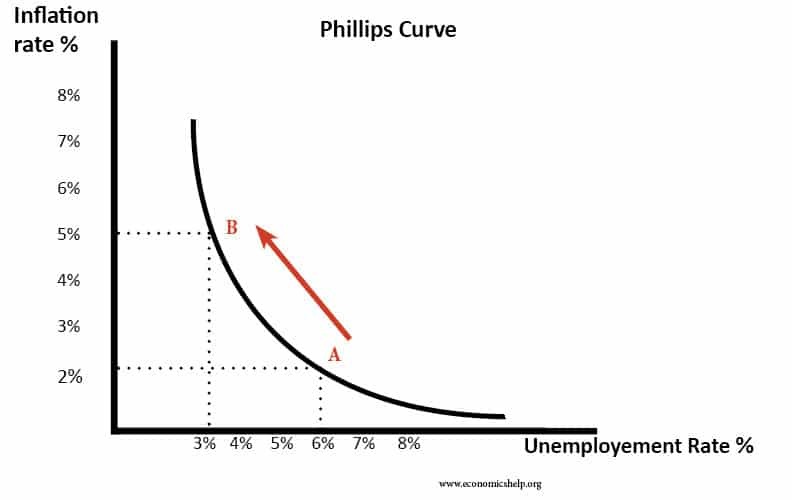 Demand pull inflation can also be shown on a Phillips Curve. A rise in demand causes a fall in unemployment (from 6% to 3%) but an increase in inflation from inflation of 2% to 5%. 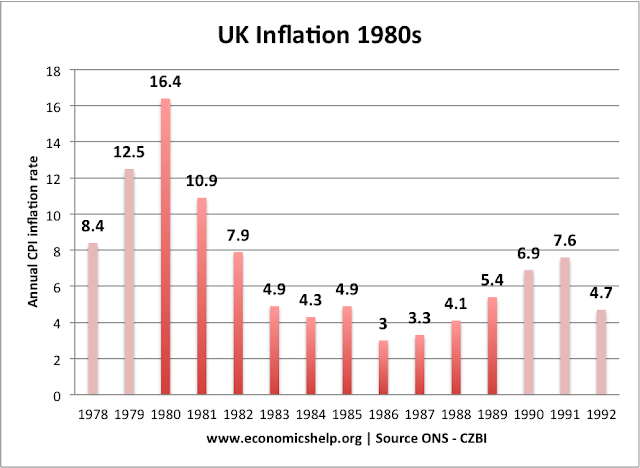 From 1986, inflation increased to 1991. This was an example of demand pull inflation. 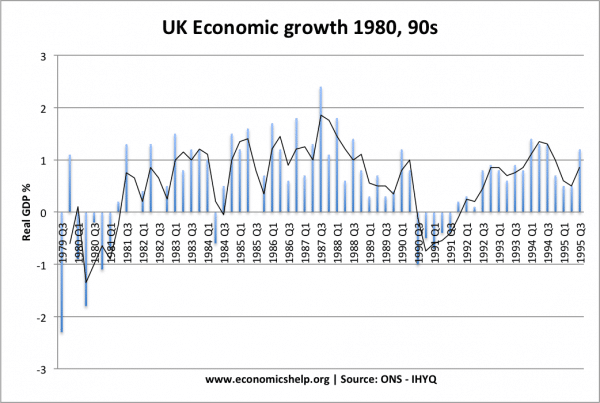 The quarterly growth rate in the UK. Cut in income tax rates. The rapid growth in demand saw inflationary pressures increase. 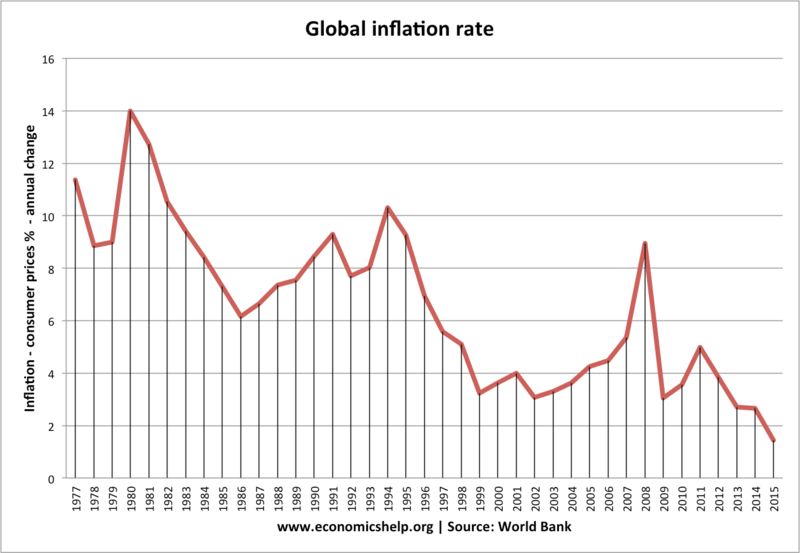 Rapid economic growth in the mid-1960s, caused inflation to increase from 2% in 1966 to 6% by 1970. Cost-push inflation (rising costs of production). For example, in the early 1970s, economic growth and rising oil prices caused a spike in US inflation of 12% by 1974. Built-in inflation. Inflation has its own momentum. High inflation in previous years, makes future inflation more likely as firms put up prices in anticipation of repeated inflation. Downward pressure on prices from the global economy. Deflation of manufactured goods in Asia. New technology leading to lower prices.